Another rainy day in Hallstatt. It really hasn’t let up at all, this storm seems to be stalled over Hallstatt. The creeks and streams and waterfalls are raging, I wouldn’t be surprised if there’s some flooding somewhere. Tis time to go though; I have a long drive today to get to Appenzell in Switzerland. 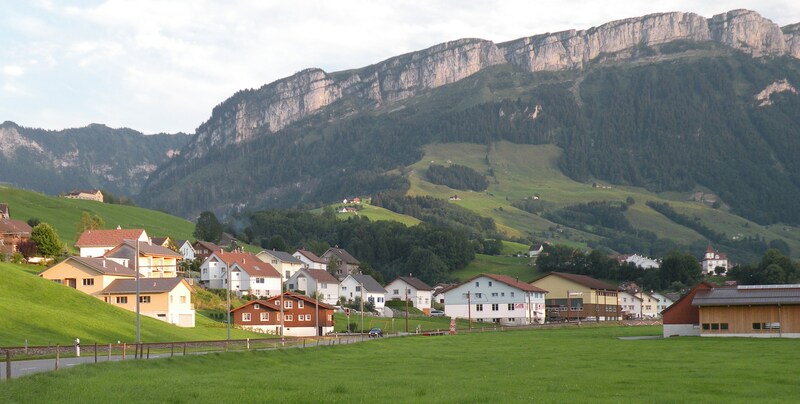 I don’t have any reservations anywhere, my main target is Gimmelwald, but that would be too long of a drive so, Appenzell is a nice half way point that my friend Alba strongly recommended I see. Once I was out of the lakes district, the weather was clear and sunny. I had a great drive and a great time, it was a good full day. I was in a great mood and just listening to my tunes going down the road. Missed a couple of turns, but got straightened out eventually. That’s getting so frustrating, I’m seriously considering buying a GPS. 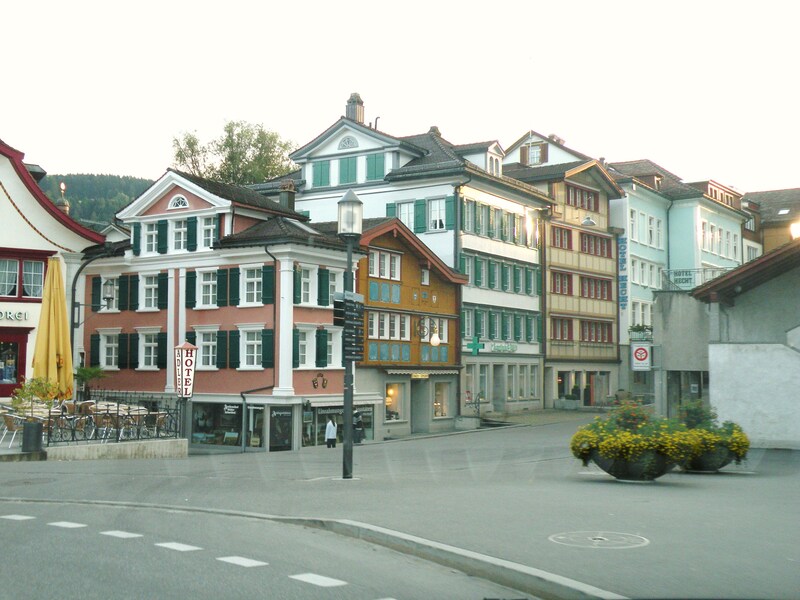 I stopped in Zell am See and drove around a bit, lovely town. The maps I have leave a lot to the imagination; I keep looking for better ones. I came up to a booth of some sort and had to pay a fee, I thought I was in Switzerland and this is the road use permit or something. After another couple of hours I came to a toll booth and I handed my credit card to the guy. He looked at me real funny. I looked around and noticed several serious looking men in uniforms. Apparently, this was the Switzerland border and I just handed my credit card to the customs agent. I don’t know what that other booth was. Well, he handed my credit card back and I think he realized what I had thought and he just smiled at me as I searched for my passport. He just waved me on. I stopped at the first ATM I could find because Switzerland is not a member of the European Union and their currency is the Swiss Frank, and I needed some. 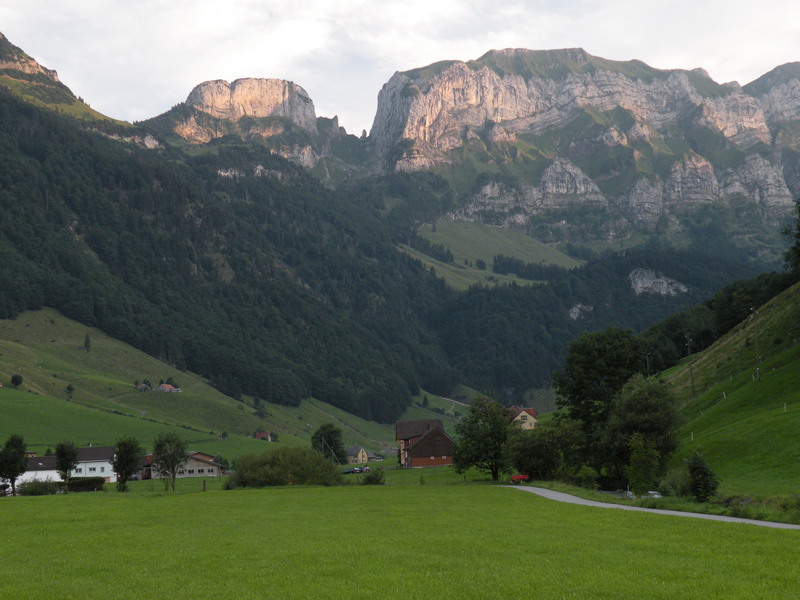 I made it to the general area of Appenzell about 7:00pm and couldn’t figure out what all the hoo ha was about. I went through a town and started up a hill and oh man I figured out real quick what the hoo ha was about. High alpine villages and meadows and spectacular views. The grass on the rolling hills is so thick. It’s like someone flung out a giant green carpet over a cluttered floor and let it settle. 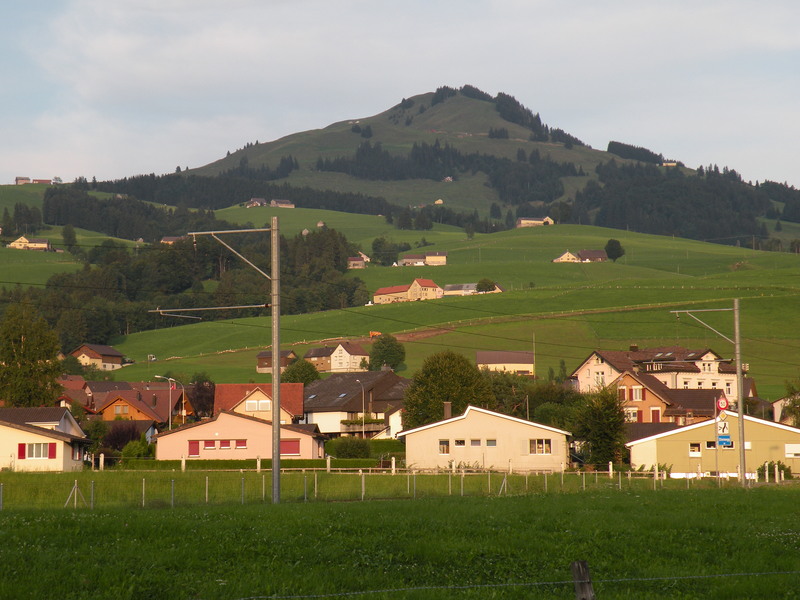 I finally found the town of Appenzell, very quaint, but everything seemed closed. I mean the hotels too, most were dark and seemed abandoned. Very strange. I headed for Ebenalp, where there’s a cable car up to somewhere and then a hike to where I wanted to stay. I called a few days ago, but they were full. I want to check it out anyway tomorrow before I head for Gimmelwald, so I at least wanted to find the cable car station tonight so I don’t have to hunt for it in the morning. 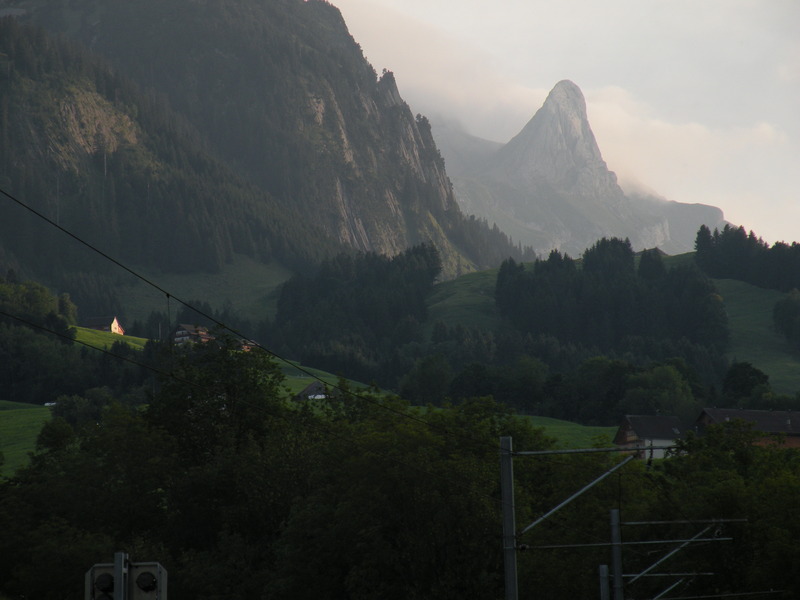 After I found the cable car station, I went back to Appenzell where I started looking for a place to stay and was turned away from one place after another. Everyone was full. It’s the weekend, duh. I know what the date is, but I’ve completely lost track of what day it is. I kept trying and finally found a place with one room left. They said it was an old room and I got the impression from their description that it wasn’t that great. I asked to see it and I was thrilled. It looks fine. I have to duck to go through the door and once inside, you notice the ceiling is pretty low. I can stand upright though with some clearance. The hotel clerk told me it’s because the Appenzellers all used to be short. 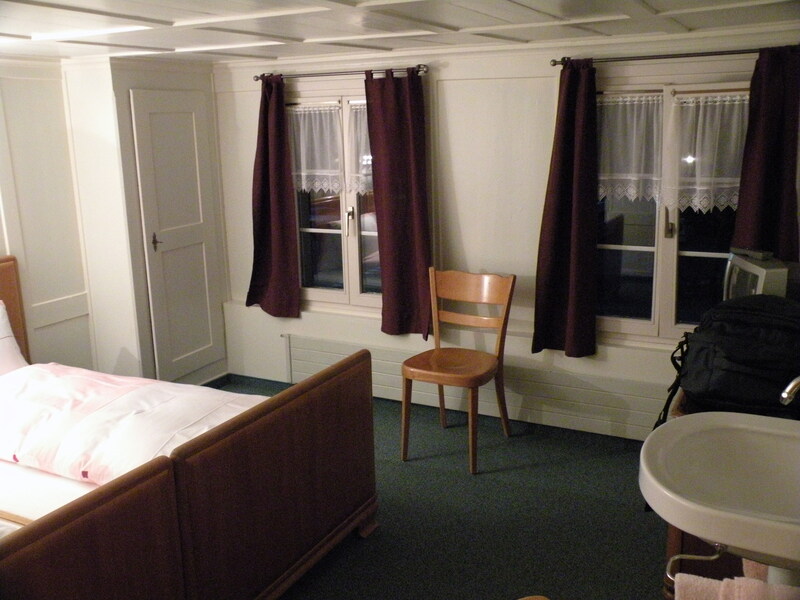 I quite like the room; the low ceiling and wood plank walls and ceiling make me feel like I’m on a boat. This scene like many you’ve sent doesn’t seem real. Again, reminds me of Disneyland but much better of course. Thought you might have sent pictures of your room but guess not.